AS one approaches Cambridge, one begins to breath an air that is infused with the wonders of knowledge and learning, with the romance of history and culture, with curiosity, openness, awe, humour and tolerance, and an insatiable desire for the world of progress through freedom. One wonders of the times when Newton, Coleridge or Byron must have studied here; one cannot help but conjure images of cloistered walks, of punting and May Balls all of which give a sense of not what is tangibly visible, but cultural treasures and attitudes to life that lie beneath the surface. The real enchantment of Cambridge is, indeed, of the intimate kind, a place which has preserved a set of ideals within beautiful surroundings for over three quarters of a millennium, and where, as Hermann Hesse writes, "Everything is worthy of notice, for everything can be interpreted." Cambridge is a place where "ideas are generated, contested and disseminated." A literary evening in the common room of Churchill College discussing the inputs of the Marlowe Society, a lecture on the ‘History of Philosophy of Science’, a conversation on racism, a discussion on the pharmacological aspects of psychology versus the environmentalist view, or the relationship between neuroscience and computer cognition takes the mind beyond the narrow confines of a discipline. The college-based tutorial system gives encouragement to come out, write and discuss. It forces the teacher and the taught to "work out what you really think". Undergraduates are not forced to attend lectures; they turn up only if they feel it is useful. I agree with J. M. Keynes that "it was exciting, exhilarating `85 the opening of a new earth". Such is the culture that Alan Macfarlane reflects on in his book that takes you through the traditions and creativity of a university town that has cast its magic on those who pass through it and those who live and study here. 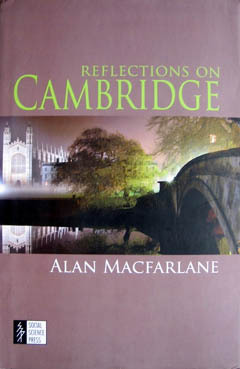 This historical and anthropological account by a Professor of Anthropology captures passionately the inspirational qualities of its culture, the Backs through which the placid river Cam has weaved its languid way for centuries, and the history and architecture of Cambridge. More than anything, wine drinking is singularly relevant to the university’s social and academic calendar. I remember attending the best lectures after supper. You entered the room, and as the lecture began you could help yourself to a glass of wine. MacFarlane mentions in this context the old saying, in vino veritas (in wine—truth); it is true that a drink with the Fellows gives you a sense of truth and an openness so vital for the exchange of ideas: "One can tell the truth more directly, and learn truths that would normally be kept hidden". The mind "needs to relax" with a half-full jug of beer or a welcome glow of good ale at the end of intense intellectual work: "It is possible to go more directly to one’s inner thoughts and hunches `85 the imagination is released to play more intuitively with hypotheses." You have everything in Cambridge but the magic is hard to describe. The Bachelor’s Walk between Trinity and St John’s or the Bridge of Sighs, the 15th-century organ screen in the King’s College Chapel all bring to mind the humour in Rupert Brooke’s nostalgia: "My heart is sick for several things / Only to be found in Kings `85 / I do recall those haunts with fears / The Backs, the Chapel, and the Rears`85 ." What the world would have missed if in 1209, the hanging of a scholar owing to the conflict between the town and the gown had not compelled many academics to migrate to Cambridge. Peterhouse was the first college founded in 1284. By the end of the 16th century, the town was well established as one of the most important centres of higher learning and religious radicalism. The civil war ushered in an era of allegiance to the Royalists followed by the adoption of modernity with the coming of the industrial revolution. The town of Cambridge has had such a chequered growth that its contribution to science and humanities has indeed left an indelible mark on the history of contemporary civilisation. As MacFarlane rightly puts it: "Cambridge is a museum, but not just a passive one with static objects in glass cases. Rather it is like the computers which were to a considerable extent dreamt and devised in Cambridge. It thinks, adapts and changes with the world. Yet, the programs that run it are often, in essence, centuries old. They were laid down early on, but were general and flexible enough to absorb the vast transformation that would happen during its eight hundred-year history."